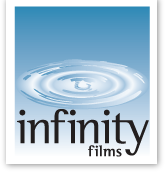 Infinity Films covers the spectrum from features and documentaries to television comedy, drama and variety. But whatever form a production may take, we are first and foremost storytellers. We are a writers’ company, always beginning with a singular dedication to compelling scripts then following through with the vision of outstanding directors, cinematographers, designers, and editors to produce the high-quality entertainment for which we have become renowned.